That was it. The moment that made history. But this time there was no gold medal, nor a Stanley Cup. All that was left to the ground was burnt flags, garbage, broken glass and alcohol streams. All is that is left in our mind are degrading images of drunk, high and sadistic anarchists, criminals and grungy followers destroying our city. Friday June 10, 2011. The Canucks of Vancouver wins 1-0 against the Bruins of Boston. Game 5 of the Stanley Cup. 2 days closer to celebration. The game was tight, the game was strong. Around 100,000 fans reunited together in downtown to watch the game on the big screens. And there it is: Max Lappiere scores the first and last goal of the game. Notching his team to within one win of the Cup. Evoking joy and sanity in the city. When the period ends with a third game win for our team, the crowd disconnected from the ground, jumping and bouncing around from happiness and excitement. Not only flags are flying high, but also smiles and high fives! My hand couldn’t get tired of clapping people’s flat palms. My cheeks were holding my smile up high. Celebrations went on and on. It was a good night, yes, a good night. Wednesday June 15, 2011. The Canucks of Vancouver lost 4-0 against the Bruins of Boston. Game 7. The Stanley Cup. I rushed my way down to the city to embrace one more time the energy of the crowd. Yes, I was hoping for an other win. Perhaps I was selfish or too positive. But I felt that we could do this, this time. The sun was warm, the fans were ready. I squeezed my way amongst old and young canucks for a place to glimpse. The game was hard to see. I mean, there was so many people in front of me… But seriously, it was hard to see. The last minutes of it were the most painful. I mean, bottles and shoes were thrown at the big screen until it broke. We couldn’t see the end, only could we imagine. It could’ve stopped right there. We knew our defeat and so be it. We arrived second, didn’t we? Isn’t this enough for us, Canucks? Yes it was. But for an incomprehensible percentage of idiots, calling a riot in our beautiful streets seemed the plan for the night. After the main screen broke, a car got flipped, then burned. Black smoke ruined the air and rioters got hit by the flame; hit by the flame of destruction and mayhem. Cocktail bombs were thrown to the ground and glass bottles were propelled in the air. Reactions aroused amongst the crowd: fires, fights, screams, vomits, loots, blood. The perfect recipe for a nightmare in beautiful BC. Currant of hundreds of fans were crashing one way, then the other. At some point, following the pod, I had no idea if I was running away from something, or running after something. 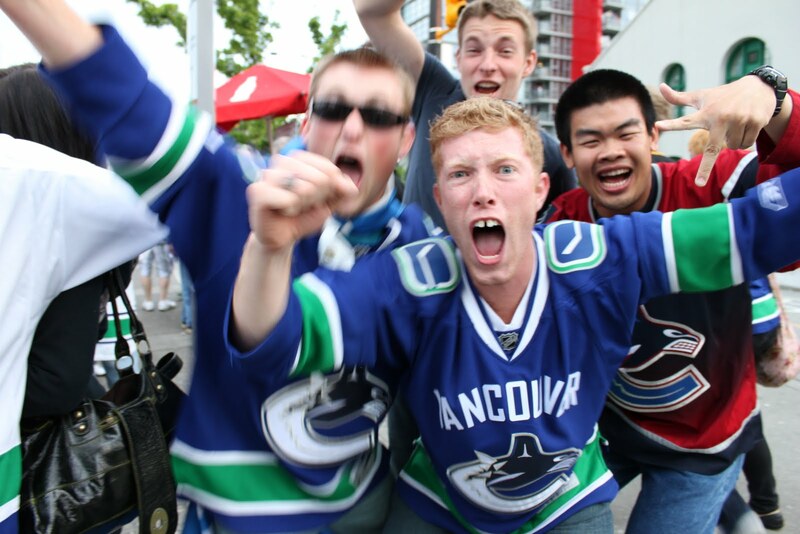 The city was turned into a massive ocean infested of crazy Canucks. 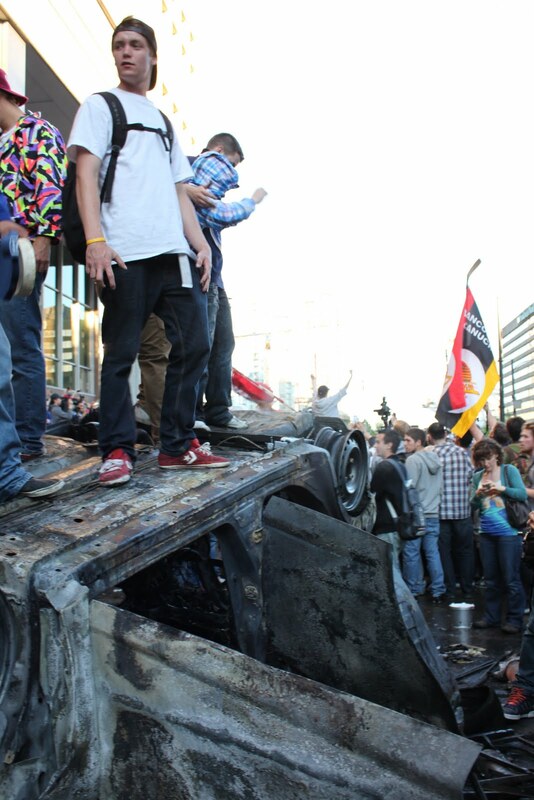 Fools were jumping on cars set on fire, while others were looting stores and breaking windows. Some were shooting cocktail bombs at cops while others were smashing residents vehicles. Aren’t we in 2011 where the invention of such things like iPhone and social media offer direct online information? Yes, fools. You are all fools to think you will be able to run away safe from your mess. I feel angry. I feel sad. I feel scared. But somehow, I am standing in the middle of this civil disorder. Call it excitement, call it curiosity, I feel ashamed, but I wanted/needed to be there and capture the moment, from my own eyes. And let me tell you: it was absolutely insane. 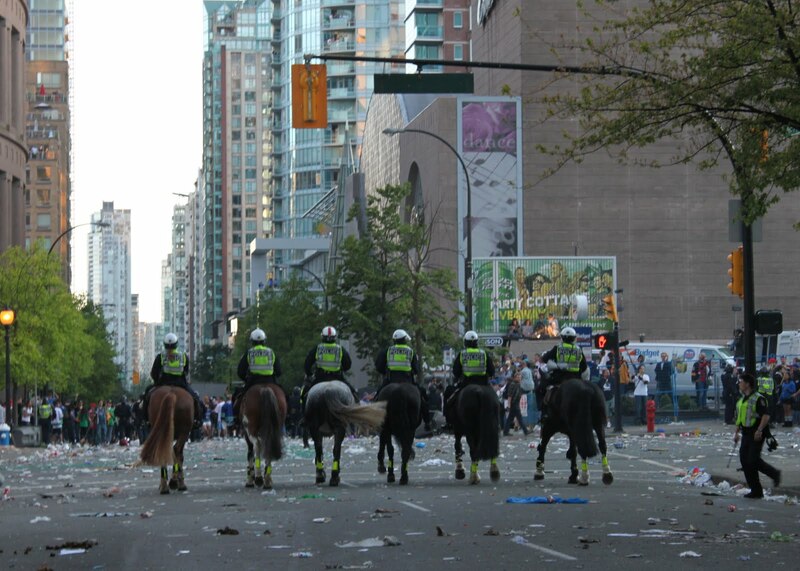 After the army of police lined up with their mounted team and announced their advancement in the square to clean people away, I decided it was time to leave. I snapped some more pictures, and left the scene. When I thought I was getting away from all this commotion, it didn’t take too long for me to realize that the riot already spread in all the streets nearby. The parkades were filled with lunatics hitting cars. An old man collecting money at the entrance of the parkade got expulsed from his box after the window got smashed on him. Rocks were thrown. Glass as well. People were hit and injured. There was blood everywhere. Two young bandana-covered-faced men robbed a private boutique and stole mannequins and clothing, then hustle past me while running. A 10-year-old kid hit an advertisement light box with a hockey stick. The glass broke and he happily replayed the hit. What the hell happened to our citizens? Damn. That’s it. I had enough. The sky was so beautiful that night. It was blue and it finally felt like summer. I wonder what would’ve happen if we have won. A perfect night like Friday night? 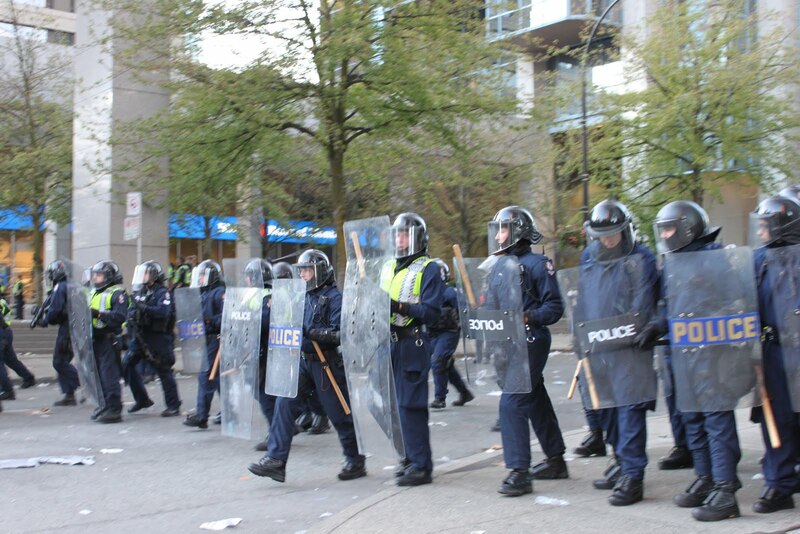 But this time, rioters came prepared and ready to fight. They were excited and had the objective to reproduce the 1994 crime, one more time. But what if the winning of this game spread a positive energy over the city? Would’ve this make a difference? I don’t know. What I know is that we now have to heal a bruised city, grow with this moment and try to understand where we went wrong. I want to point at those lucid fans that stepped in the middle of illegal actions, risking their own safety to stop this pandemonium. I want to point at the police that tried to diffuse a positive energy by acknowledging appreciation to cooperative fans. I want to point at those homeless people cleaning up the streets while collecting bottles for personal allocation. 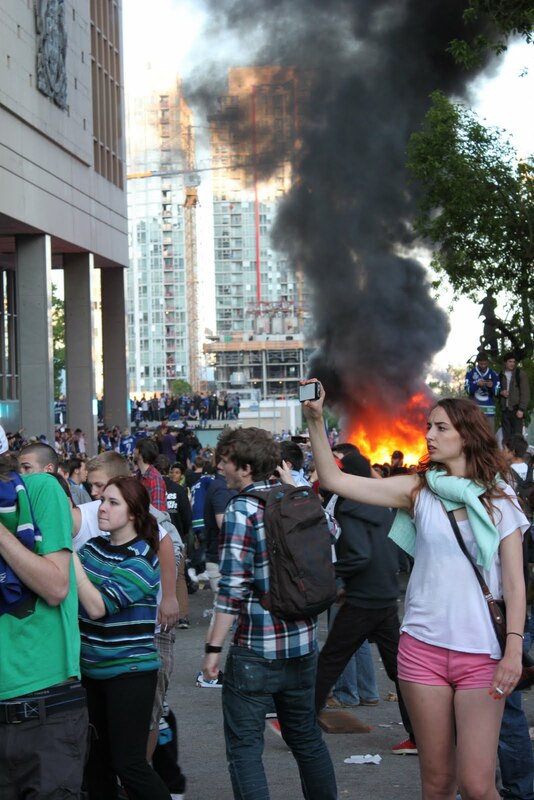 I also want to point at all these Canuck fans, I mean, the true ones that volunteered to clean up the streets this morning. Thank you!. 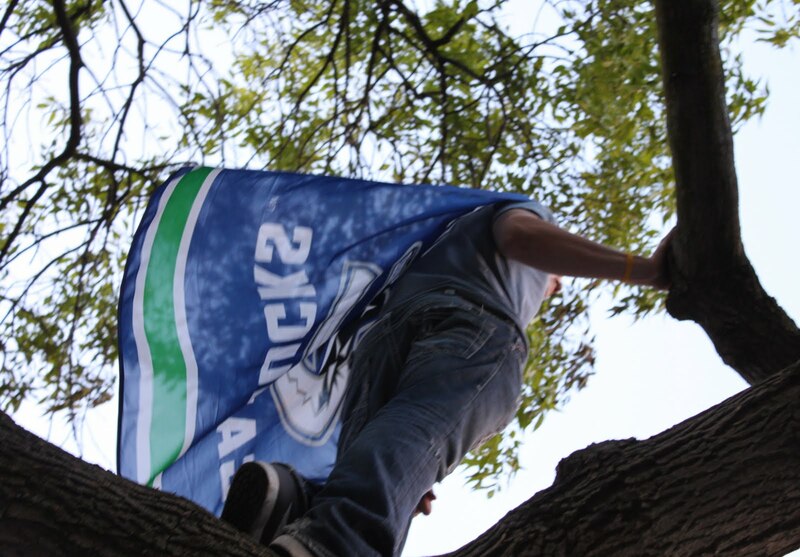 But most of all, thank you Canucks for making this hockey season the most exciting one since 1994. You were so close! Congratulations for rocking that ice and making Canadians proud (forget that riot, it wasn’t yours, it was theirs). And congrats Bruins. After all, they are kissing the Cup right now. The full moon raised over Vancouver last night. The smoke disappeared. People got arrested. We made the Top Story news worldwide. It’s time for me to go home. We haven’t win the Cup, but hey, we’ve got the Gold ;)After the army of police lined up with their mounted team and announced their advancement in the square to clean people away, I decided it was time to leave. I snapped some more pictures, and left the scene. When I thought I was getting away from all this commotion, it didn’t take too long for me to realize that the riot already spread in all the streets nearby. The parkades were filled with lunatics hitting cars. An old man collecting money at the entrance of the parkade got expulsed from his box after the window got smashed on him. Rocks were thrown. Glass as well. People were hit and injured. There was blood everywhere. Two young bandana-covered-faced men robbed a private boutique and stole mannequins and clothing, then hustle past me while running. A 10-year-old kid hit an advertisement light box with a hockey stick. The glass broke and he happily replayed the hit. What the hell happened to our citizens? Damn. That’s it. I had enough.